The title of this post isn’t some cryptic riddle. There’s no prize to be given away to the person that gets it right, and I won’t be asking anyone to turn their Facebook profile photo into a giraffe. Some of you may recall the Olympia SM1 that I purchased over at Woolloongabba antiques earlier this year that I promptly set about removing a layer of filth from its shell. Well, I dropped that typewriter to John Lavery who gave it a final fixing and fine-tuning for me (thank you very much John!) which subsequently led me to developing a short lived secret and financially unhealthy obsession with Olympia typewriters. 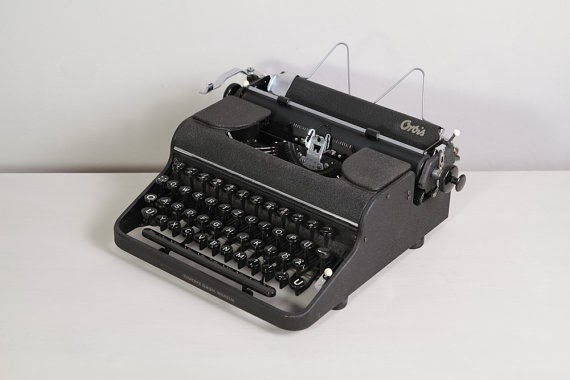 The SM 1, or as some like to call it – the Olympia SM, sort of feels like an unfinished re-design of the original Olympia Progress typewriter. However has bucket-loads of charm and style and is still a very appearing machine. Other than the oddly obvious screws on the side of the typewriter, the SM is quite a polished and distinctive machine. It is very well made, and is excellent to type on. So surprised by the quality of the early Olympias, I soon found myself looking for other Olympias of more developed years on ebay. This was a short lived obsession that culminated in the purchase of a maroon machine that I spotted on German ebay. I contacted Peter Muckermann and he kindly agreed to forward the machine onto me (danke Peter!). After a few weeks I had in my hands a gorgeous Olympia in the colour that Olympia does so well. The typewriter unfortunately came loose in its case during transit. But as a testament to the quality of the construction of these typewriters, the machine sustained no damage other than a miss-placed escapement release bar. On the other hand, the clips the held the typewriter in the case were substantially bent, including the thick steel support rods located at the top of the case. These took some real effort to get back into place, and I can only conclude that the typewriter copped a hell of a knock in transit. 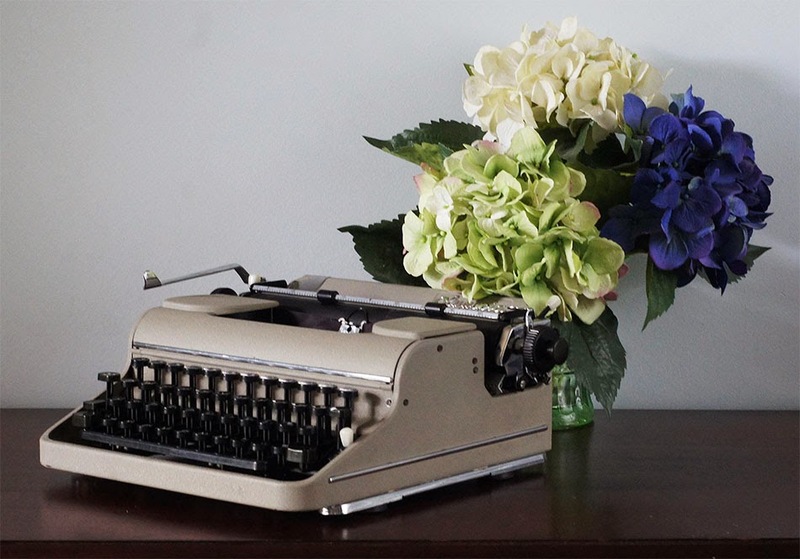 But I was so pleased to have this beautiful typewriter in my possession that I really didn’t worry too much about what had happened to it. Hey, it is usually nice to have something to fix. But there was something strange about this typewriter. Something… didn’t feel the same when I tried to type on it. While the paint was the same crinkle paint as my other SM, it was a very glossy crinkle paint that was quite different to my other machine that was Matte. Over all, it just didn’t…. feel…. 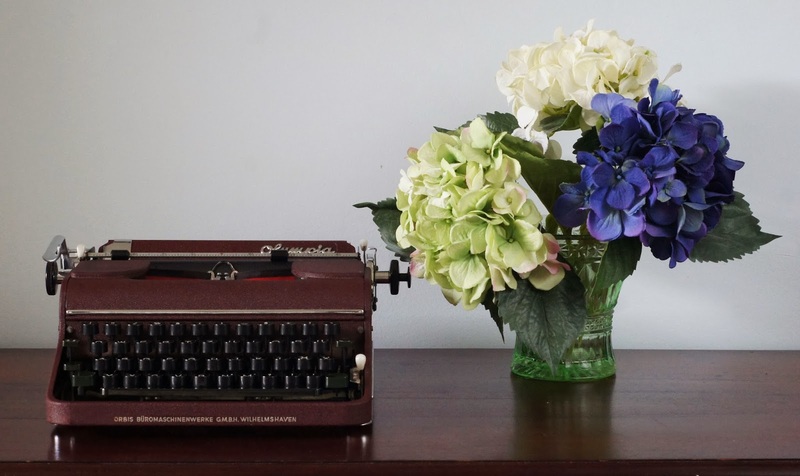 the same typewriter. It didn’t type worse, it just typed differently. It was a bit dirty, so I couldn’t tell if it was faster or slower as yet but there was definitely something different about the keys. I looked closer and discovered something that I wasn’t expecting. Looking at the photos above I’m sure some keen eyed members of the typospherian will no doubt spot something a little bit different to the normal SM1 labelling. But if you didn’t, here’s a closer look. The back of the typewriter was also quite revealing. Whereas the label on the back usually has the very familiar cursive ‘Olympia’ logo, this machine instead has ‘Orbis’ in its place. Other than the glossy crinkle paint, there were also some other substantially more significant differences between the machines. 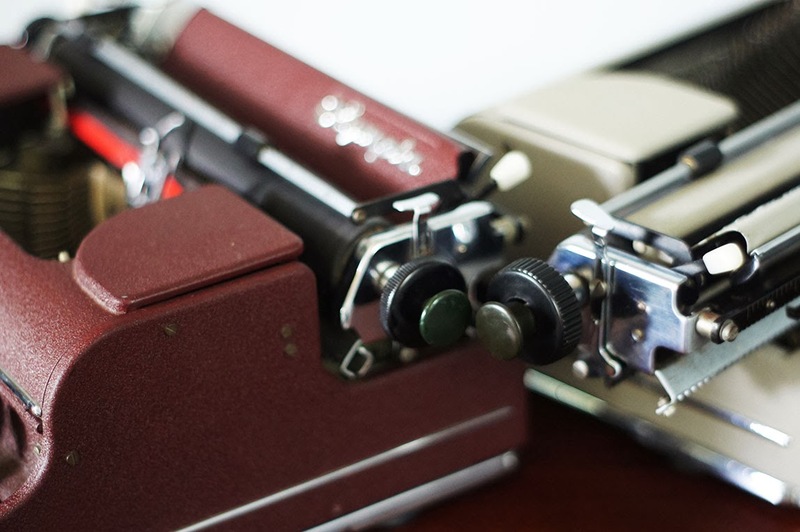 Firstly, the two typewriters have different platen knobs. 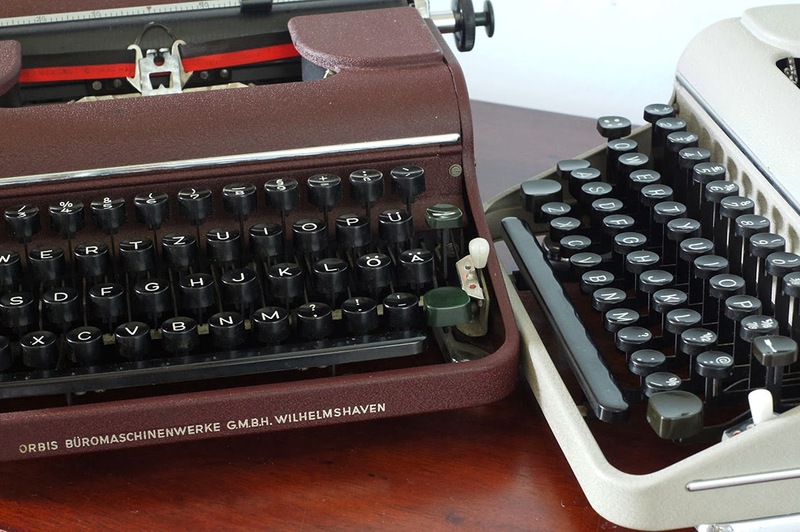 The plastic on the maroon typewriter felt and looked different to the larger, but less well-made versions featured on my SM1. 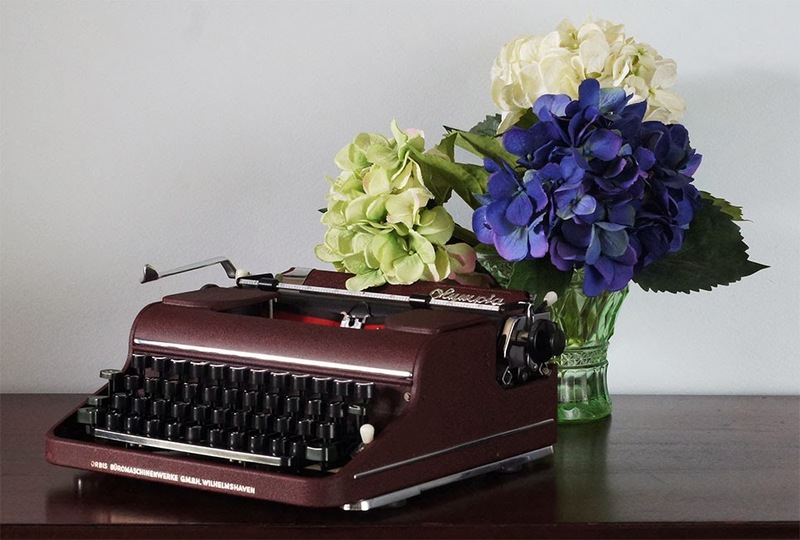 The Maroon typewriter has quite a different case, which is colour-matched to the machine. Also, the maroon version of this machine has a significantly different keyboard. As you can see, they keys on the maroon machine are significantly thicker, and have a sharper edge around the ring. My original SM1 has keys that are identical to the older Progess/Simplex/Elite machines from prior to WW2. The differences between the keys aren’t cosmetic either. You may also be able to see that the metal tabs under the keys that slot perpendicularly to the type lever don’t extend as far down as they do on the SM1. As it turns out the keys on the Maroon machine are a lot more complicated. They have several interlocking parts, and appear to facilitate the keys to spring, like what we are more familiar with on the SM3 and 4 machines. The keys themselves feel oddly weighted compared to the SM1. Naturally my first response was to jam ‘Orbis’ into google to find out what on earth I had in my hands. Unfortunately very little came up. And what did come up was a confusing mix of bit-parts. So I promptly hopped onto email and messaged the most knowledgable guy that I know, that probably isn’t going to have a problem with me late-night work-fatigued lack of english language skills. So I emailed Rob Messenger. Rob didn’t have a lot, but he had some interesting things to say about ‘Orbis’. Between Rob and the other sources that I consulted, I eventually got a very vague picture about the history of this typewriter. After WW2 the bulk of the Olympia design and engineering workers managed to have somehow gotten themselves over the border from East Germany and into the more business capital orientated West. Here they began to set up a new company to begin building typewriters again. However, they appear to have faced a few barriers. Firstly, they had no money. They attempted to extract the capital that was related to the original Olympia interests in East Germany, but were reportedly thwarted at the last step. Secondly there was a tussle over who had the rights to use the ‘Olympia’ name. As such ‘Orbis’ was born. Orbis was a name that had been associated with the company before. 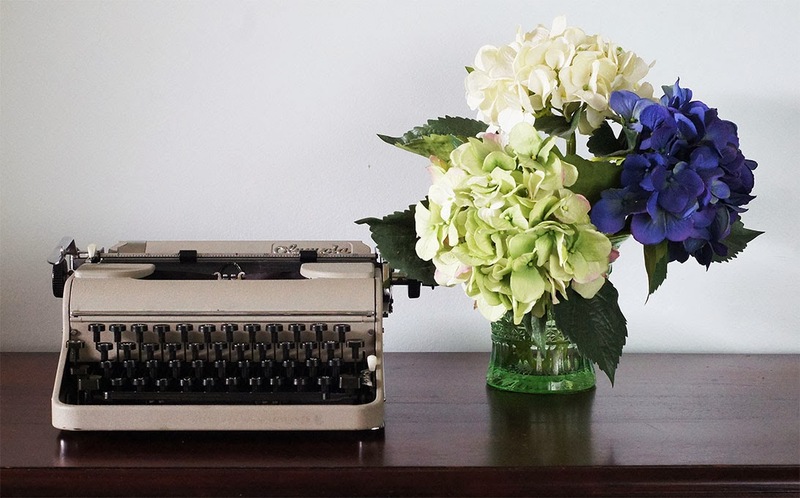 While the legal fight went on, the company started to produce typewriters. However the company must have seized control of the name early in manufacturing, and as such The machines ended up being badged ‘Olympia’. On the East German side Optima was formed, and they used existing designs to construct Olympia machines. However the paper table gives away something about the history of the maroon machine. The ‘Olympia’ badge sits in an oddly recessed shape on the paper table, that looks like it is some kind of slot in plate. While I was doing some investigation into the ‘Orbis’, I found this photograph on Pinterest. This machine features the same carriage lever, keys, rubber feet and paper stand from the pre-WW2 machines, while it has the later crinkle paint, and at least 1 of the chrome strips. Note that the badge does not sit in a recessed section on the paper-table. 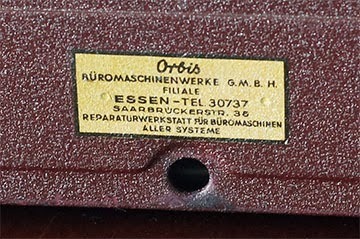 If you look at the typewriter database there is an Orbis model listed which was made for approximately a year – around 1949. This machine was reportedly over-engineered and significantly more costly than the prevailing SM1. I don’t have a lot of information about this era of machine, and a such it is open to conjecture about what machine is what. 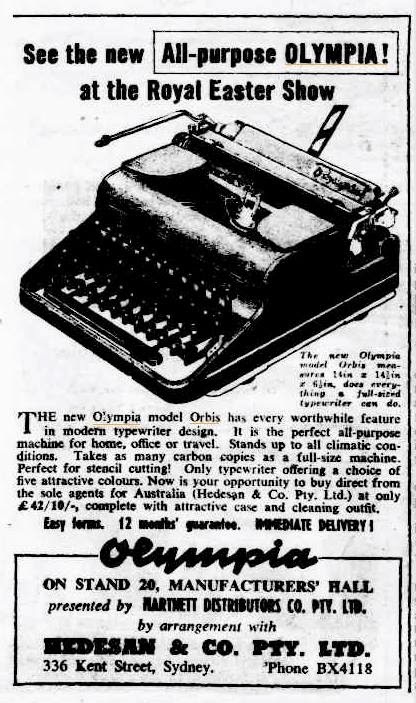 This becomes even more complicated when you discover ‘Olympia model Orbis’ machines being advertised several years after the 1 year manufacturing period of the ‘Orbis’. From the ‘Sydney Morning Herald’ in March 1951. Similar ads featured in the newspaper until late 1952. The ‘Royal Easter Show’ is a large rural fair that occurs in Sydney every year. The machine in this photo appears – with a bit if eye-straining, to have the same platen knobs of the SM1, and the same keys. It is possible however that this is largely a over-stock line that was expensive and hard to sell in Sydney at the time before, they started selling SM labelled machines. But that is pure speculation. So, very little is clear about this maroon machine. But that doesn’t detract from me enjoying it. Then again, I have suddenly found myself with a handful of Olympias, all of which are magnificent machines. But more about that later…. November 17, 2013 in advertising, collection, maroon, Olympia, Orbis, SM1, typewriter. ← Mum, the typosphere is in the letterbox again! Ahh, Olympias. One is NEVER enough. Could Orbis be a stationery company that had Olys branded for them? I'd seen an Orbis before on eBay.de but never an one labelled with both Olympia and Orbis at the same time! As I recall, the Eastern company kept the name Olympia as long as it could until it lost the legal battle and then switched to Optima. In between I think they built machines with the name Erfurt for a while. Yes, very interesting. I like the maroon colour, but prefer the flatter keys on the other. (why it's impossible to comment on blogger posts with a wordpress account I have no idea!) Steve K.
I don't think so. It definitely was a name that the early post-war Olympia was trading under. And you know what…. I think you're right! I've got quite a haul now. I'm guessing that there was a concerted transition period. I'd really like to know much more. AH! I completely forgot to add the serial numbers. I'll get onto that soon. And yeah, it'll go onto the database when I have a bit of time to upload a heap. There's eastern constructed Olympias? Oh…. You've just set me a challenge to find one! Yeah, Google certainly doesn't like anyone else playing in their sandpit. Honestly, the next blog I make will be on WordPress. And I have to admit I'm absolutely in love with the maroon coloured olympias. Steve… I have an inkling that you might be in Brisbane. Am I right? Hi Scott, the other side of the country – Perth. Well, you're at least in the country. Greetings fellow Australian.